Words: M. E. Ser?oss ? 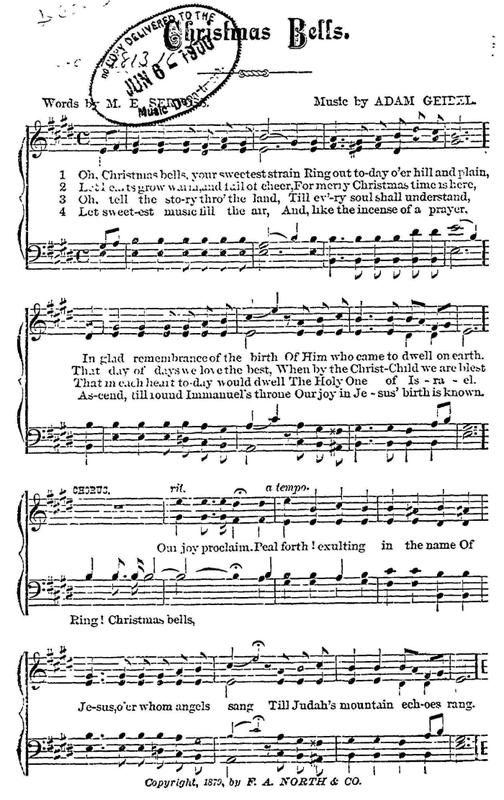 Source: Library of Congress, Rare Book and Special Collections Division, America Singing: Nineteenth-Century Song Sheets. Of Him who came to dwell on earth. Till Judah's mountain echoes rang. An over-stamp of the original made it difficult to discern the name of the lyricist. In addition, corruption in the original or the scan made it difficult to determine the first few words of the second verse. The Senior Music Specialist/Reference Librarian in the Music Division of Library of Congress provided prompt and excellent assistance in resolving the latter issue. He also noted that the original copyright did not contain the name of the lyricist. Thanks and a tip of the hat for great service!